For those that haven't seen it yet, Misty Cato has a fantastic tutorial on her blog about blending photos into the background paper (http://mistycatodesigns.blogspot.com/). I have been using Misty's tutorials (along with Shauna's and a few others) to slowly educate myself about PSE. 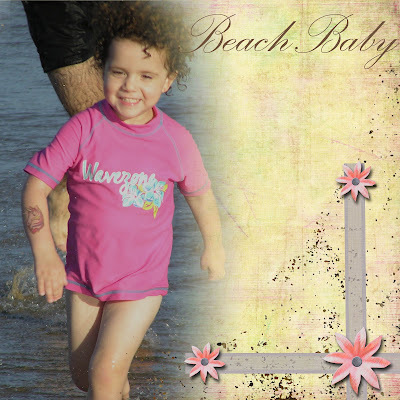 As soon as I saw the background paper she used and the position of the blend I thought of this piccie of my darling daughter at the beach recently so set out to have a go. After a few emails with Misty - because I am a TOTAL luddite - I got it to work and this is the result. So far LOL. I am probably going to expand to a two page LO, and add my journalling. But I was really pleased with the result. Off to read to the kids - we are in the middle of Enid Blyton's Magic Faraway Tree ! Will post more VHC stuff tomorrow and that flower if anyone wants it just let me know. This is so gorgous. Misty Cato RULES!I just love her pink rashy and her hair is soooo cute.And what can I say about that smile? so so adorable! This is great! Did you consider photoshop-ing out the tattoo? Might work. Thanks for the plain papers and the frames, too. I was just about to say you should photoshop out the tattoo, but terebene beat me to it!! Have a great weekend Erika.